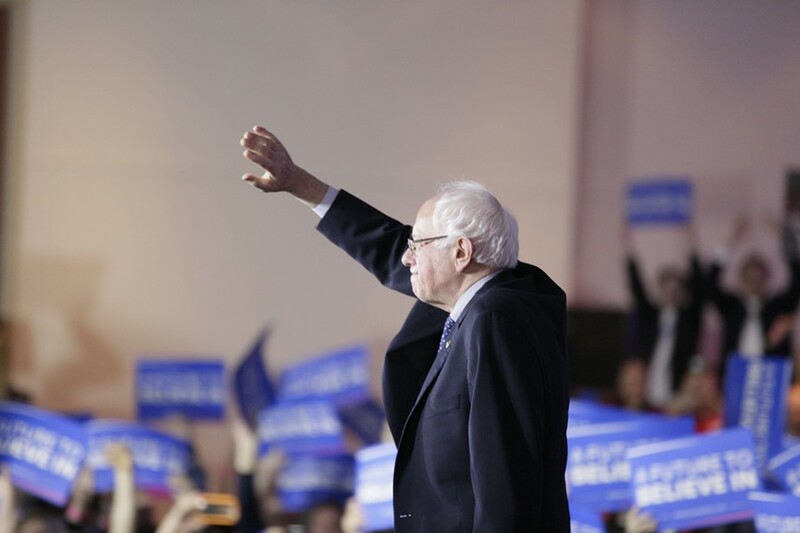 Sen. Bernie Sanders greets supporters Monday night after scoring a "virtual tie" in Iowa. Updated Tuesday, February 2, at 6:36 a.m.
Late Monday morning, Sen. Bernie Sanders (I-Vt.) offered a final assessment of his chances in that night’s Iowa presidential caucuses. Twelve hours later, when Sanders emerged onstage at his campaign’s watch party, the score hadn’t changed a lick. With the vast majority of precincts reporting, he and former secretary of state Hillary Clinton remained neck-and-neck. It took the Iowa Democratic Party until 3:30 a.m. to declare that Clinton had prevailed by the slimmest of margins — 49.9 to 49.5 percent — and claimed 23 national delegates to Sanders’ 21. Still, for a man whom few took seriously when he joined the race last April, the result amounted to nothing short of a home run. But the people, he said, were receptive to a different message: that the economy was rigged and the government bought off by billionaires and corporations. 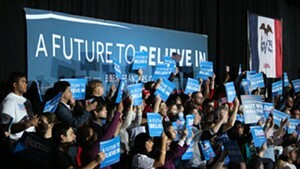 Supporters cheer Sen. Bernie Sanders Monday night in Des Moines. Fifteen minutes before Sanders took the stage, Clinton’s own speech appeared, briefly, onscreen. When Clinton called herself “a progressive who gets things done,” the crowd booed. Later that night, as Sanders supporters left the party with the final result unknown, many expressed feelings of exultation. Grace Hemsley, a college student from Charlotte, N.C., agreed. She and a dozen friends had driven 16 hours to spend the weekend knocking on doors in Iowa for Sanders. “He’s here to stay,” she said. Soon after the party ended, Sanders, his staff and a contingent of reporters headed for the airport across the street and boarded a chartered jet bound for Manchester, N.H. There, through the next eight days, Sanders and Clinton were preparing to battle again — this time in a more conventional primary voting system. What had begun as a five-way race for the Democratic nomination became a two-way race Monday night, after former Maryland governor Martin O’Malley announced he would drop out. 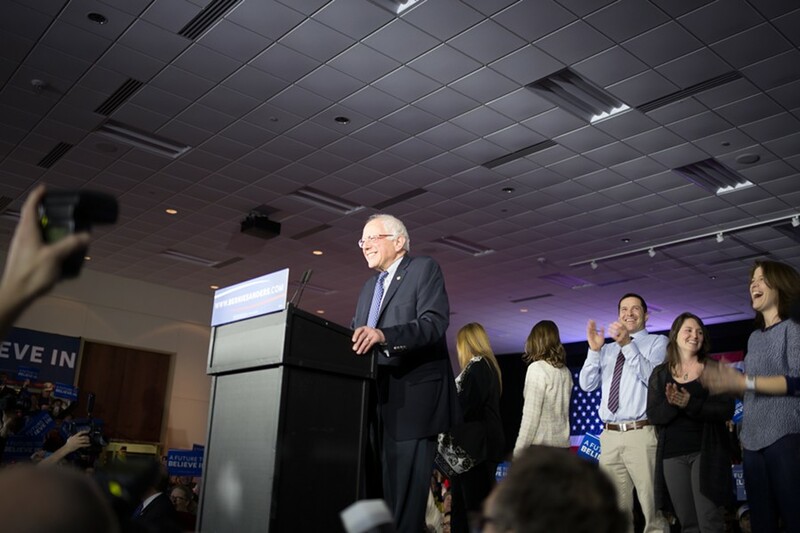 Throughout the state that evening, Iowans gathered at 1,683 precinct caucuses in schools, community centers and other public spaces to elect 11,065 county delegates. Through an intricate and lengthy process, those will eventually help elect 44 delegates to the Democratic National Convention. At one caucus, in the northwestern Des Moines suburb of Urbandale, a robust gathering of Democrats crowded into Rolling Green Elementary School. After caucus chair Jerry Tormey opened up the proceedings, a man called out for all first-time caucus-goers to raise their hands. Several dozen did, eliciting cheers from their neighbors. 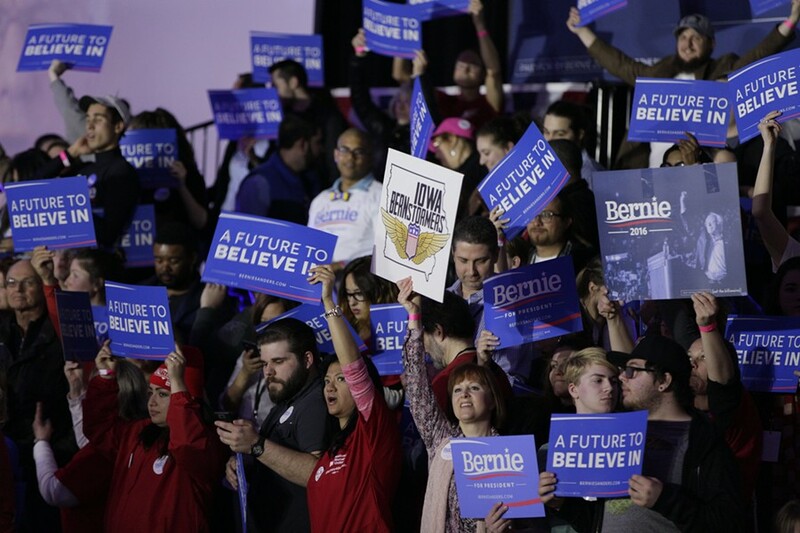 Rich Duncan, a telecommunications worker and union member, stood to one side of the room with those who, like him, planned to caucus for Sanders. Bonnie Kohl, a retired administrative assistant, stood on the other side of the room. She said she planned to back Clinton. Tormey and caucus vice chair Suki Sanford quickly set about counting attendees in order to determine the ratios necessary for candidates to accrue delegates. Within 10 minutes, they’d counted 310 people. The crowd cheered again. It was clear early on that O’Malley supporters would not reach that precinct’s viability threshold of 47 supporters — or 15 percent of those present. Just 17 Urbandale residents backed O’Malley. That meant each would have to choose another candidate. To determine how many people supported the remaining candidates, Tormey asked Sanders supporters to file out into the hallways. “Close the door!” a Clinton supporter yelled. Three Urbandale residents were undecided at first. One of them was Mike Peake, an insurance agent who called Sanders the candidate of his “hopes and dreams,” but Clinton the more experienced choice. According to an initial count, 156 caucus-goers supported Clinton, while 137 backed Sanders. After those results were announced, an O’Malley supporter shouted out that all 17 would be defecting to the Sanders side. It appeared, for a moment, that Sanders could still take the lead. But, minutes later, another O’Malley supporter clarified that, in fact, several of them would shift their support to Clinton. Tormey and Sanford pored through the numbers and tried to make them add up. Though they’d initially tallied 310 voters, they were now counting 311. Eventually, the caucus organizers agreed on final numbers: Clinton had won 159 votes in this Urbandale precinct, while Sanders claimed 148. Four stubborn O'Malley supporters refused to budge. Of the district’s nine county delegates, Clinton would get five and Sanders four. Peake, the previously undecided voter, said he had decided to support Clinton.